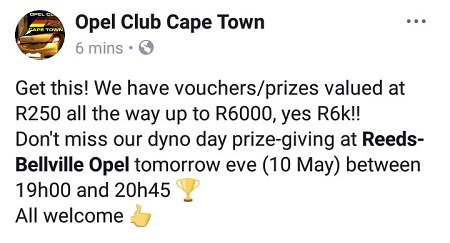 All are welcome to our dyno day prize-giving at Reeds Bellville on the 10th May (Thursday). 7pm sees us award our 27 class winners (1st to 3rd in all 9 classes) with some trophies/medals, prizes/vouchers, as well as certificates. cars are dirty . . . .are you going to complain ?